REPORT ADULT ABUSE - IT’S A CRIME! MISSION: We are dedicated to protecting vulnerable adults from further abuse, neglect, exploitation, or self-neglect and enabling adults with disabilities to remain in the community. Florida law requires the reporting of known or suspected abuse, neglect, exploitation, or self-neglect of vulnerable adults (elderly or disabled). the Florida Abuse Hotline receives reports 24 hours a day. call 1-800-962-2873 or 1-800-96-ABUSE. report online at https://reportabuse.dcf.state.fl.us. If you suspect or know of a vulnerable adult in immediate danger, call 911. For more information about Services, please contact the APS Program in your area. 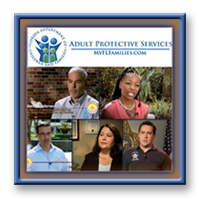 Contact Adult Protective Services via Email. If you would like information for APS services in your area, please see contact information for your county office. LICENSING: Assisted Living Facilities, Adult Family Care Home, Adult Day Care Centers Agency for Health Care Administration, Assisted Living Unit, Call 850-412-4304. SENIOR SERVICES (Age 60 & Older). Or call the Elder Help Line 1-800-96-ELDER (1-800-963-5337).